Communicare was established to equip caregivers with all the tools needed to tend to children with special needs. 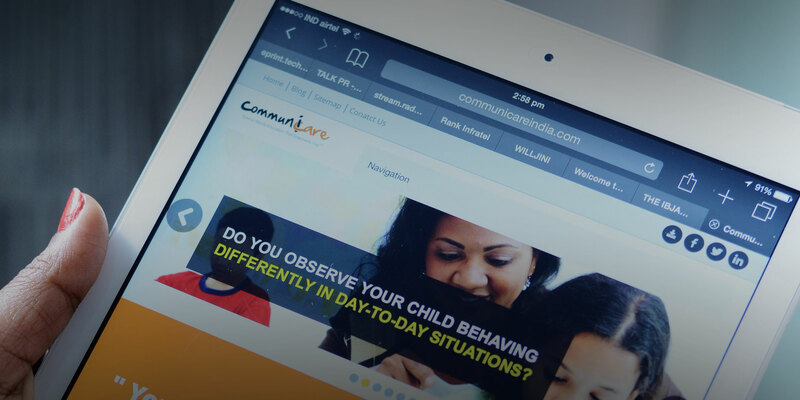 Communicare is an organization with a social initiative to provide world class education for parents, teachers, caregivers and for support resources, who regularly interact with children with learning disabilities. The previous website failed to connect an appropriate emotional chord and the viewers were left confused about its doings. We had to start from scratch, ensuring a world-class website that’s content-rich, responsive and intriguing for the viewer. Our first step was to ensure that we understand the heart & soul of this organization. Content would be the hero here and we were not supposed to sound preachy. To build an appropriate emotional connect – was the key. Add to it the expertise of our simplistic design and the responsive adaptability of the website; and bravo!!! A winner was born. Accolades came in from each viewer who visited the website. Our goal was achieved – Communicare was being talked about in every household as a solution to parental problems of raising a ‘special’ child. Senseware has really supported us very well right from content development to mobile website. The customer service is excellent and they are a proactive team. I wish them all the very best. After hours of brain storming we decided the best way to tackle the obstacles faced by Communicare was through suitable content development. Our goal was to let parents/guardians out there with special kids know that they were not alone.